In the 36 short years of Bob Marley’s life, his iconic music evolved from ska to reggae to rocksteady, and eventually into a blend of all three that, along with his wild dreadlocks, became his signature style. On his February 6 birthday, join us for a look at his band’s worldwide tours, as well as his personal life in Europe, the U.S., and (of course) his native Jamaica. Despite a diagnosis of malignant melanoma in 1977, Marley continued to travel, perform, and record. His last album, “Uprising”, came out in 1980, marking the start of a major European tour. 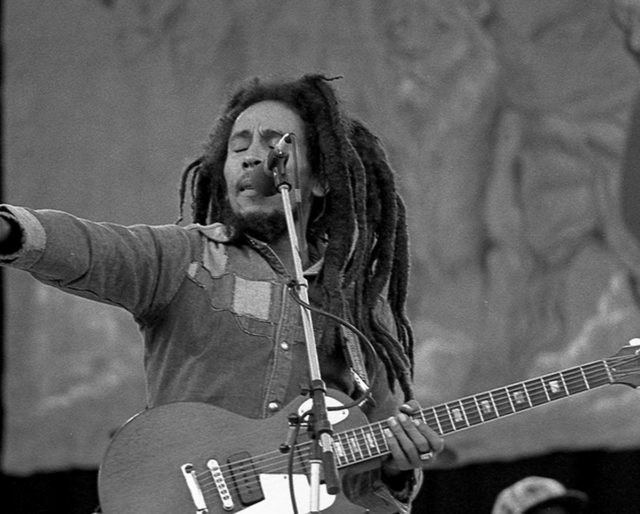 After this tour ended, Marley’s final performance came in September 1980, as his health continued to deteriorate. He died in 1981 at the age of 36. Marley’s album, Rastaman Vibration," became his breakthrough work in the U.S., reaching the top 50 on the Billboard Soul Charts in 1976. But this was also a turbulent time; gunmen seriously injured Marley, his wife Rita, and manager Don Taylor that same year. After a recovery period, they decided to relocate to England, which would expose Marley to musical trends which would greatly influence his development. Marley was raised as a Catholic, but while recording in 1962, he developed an interest in Rastafari beliefs. When he returned to Jamaica he officially converted. This change was manifested not just spiritually, but in Bob’s hairstyle: he began growing what would become his iconic dreadlocks. Marley and his mother moved to Kingston when he was 12. His childhood friend, eventually known as Bunny Wailer, continued their joint musical explorations, which now included influences from American radio programs featuring R & B. Their vocal group attracted the attention of Joe Higgs, known as the "father of reggae." Higgs taught Marley to play the guitar. Bob Marley was born in Nine Mile, Jamaica. His father, Norval Marley, was a white man originally from Sussex, England, who married a young Afro-Jamaican woman named Cedella. Norval died when Bob was just 10. Start with Timothy White's definitive Marley biography "Catch a Fire: The Life of Bob Marley." It's both a biography and a history lesson. You can keep it simple by creating a tiny braid (or two) in your hair. It may be obvious, but the best way to celebrate Bob Marley's birthday is by listening to his music. Look for "Rastaman Vibration" (his U.S. breakthrough album) or his final recording, "Uprising." Marley adopted the dreadlock style after converting to Rastafari, which drew its hair inspiration from the Bible's Nazarites. Dreadlocks date back thousands of years, including depictions on artifacts of the Minoans, who lived on what is now Crete. Is it "dreadlocks" or "dredlocks"? Does it matter? "Dreadlocks" seems to be the most common spelling, including the diminutive "dreads," but to the world's dread fans, how it looks is far more important than how it's spelled. Today, close to 40 years after Marley's passing, dreadlocks are more popular than ever, showing up on celebrities everywhere. The traditional method for forming dreadlocks is to simply stop brushing and combing your hair, and it will gradually grow matted and clump together on its own. However, whether you do it yourself or go to a salon, avoid the use of beeswax, as it's been known to contribute to hair damage.